Monday, Thursday, & Friday: 8:30 a.m. to 5 p.m.
Tuesday & Wednesday: 8:30 a.m. to 7 p.m.
Our optical shop, Optical Options of Valley Forge, is conveniently located at our medical office. We stock over 700 different frame styles, from the latest fashion and designer frames to a less expensive value line. We pride ourselves on our ability to customize your prescription with the latest in optical lens design to optimize your vision to meet your needs at work and play. We offer special lens design options for computer users, office workers and students. We are authorized providers for Varilux, Zeiss and Hoya products, which offer the latest in technologically superior lens products on the market. We offer a variety of tints and coatings, from a multi-layer anti-reflective coating to minimize glare, ultraviolet blockers to protect your eye health, as well as Polaroid sun lenses to offer the ultimate in comfort and vision while outdoors. Our goal is to provide personalized professional care to all of our patients. To achieve that end, we have an in-house lens laboratory equipped with the most up-to-date equipment, including the Santinelli lens edger which combines both manual and computerized controls to optimize each prescription filled in our optical shop. Optical Options Manager, Denise L. Allen, ABOC, is a native of Montreal, Canada. She previously worked at a retail optical shop in Chicago. She joined our practice in 2004 and was trained as an ophthalmic assistant. With her background of an ophthalmic assistant and her experience in the retail optical area, she offers clients a truly unique and rewarding experience in filling their eye glass prescription. Denise is a Certified Optician having passed the American Board of Optician examination in June of 2011. 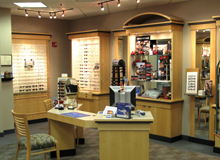 Denise is certain to make your experience in Optical Options satisfying and enjoyable. Denise and her husband, Dean, enjoy spending time with their family and traveling to new as well as favorite places.